find out about health and education projects in Syria and neighbouring countries. 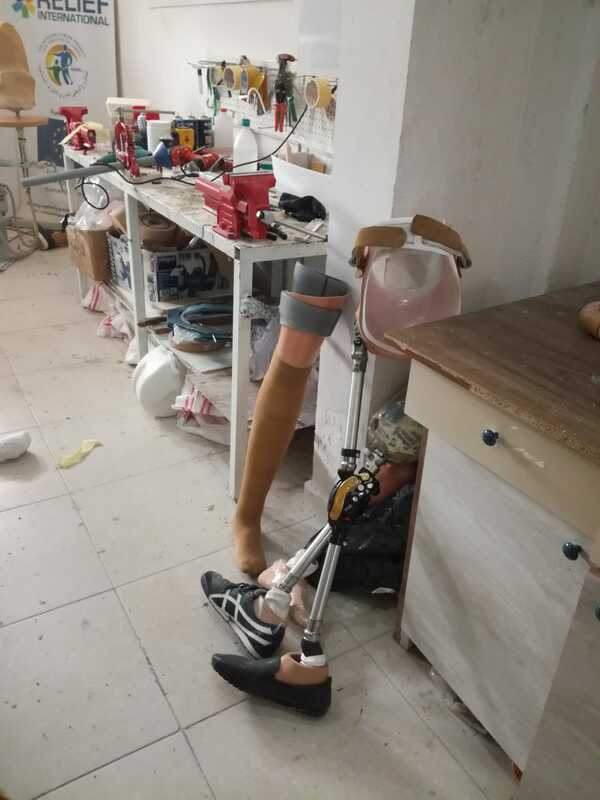 make some short films about the prosthetic limb clinic. eat some delicious, local nosh. We head out early, fortified by fruit preserves, hot pepper and walnut paste, dried fruits, crumbly and springy cheeses with bread, oil and za’atar. We’re travelling with some Syria Relief workers to their office in Antakya (Antioch) and on to one of the two prosthetic limb clinics they run, at Reyhanli on the border. Hands up funds the other clinic, which is inside Syria. The countryside is pale like the stone walls in the old town, dotted with dark green: vines and pistachio, olive and pomegranate trees. On either side of the road they’re harvesting cotton, and here and there red squares of drying peppers brighten the dusty earth. I keep a low profile in the clinic, as I speak no Arabic and don’t want to get in the way, plus I’m trying not to cry. It’s awful that these clinics need to exist. It’s awful that these patients have suffered such traumas. There are three young men practising walking on their articulated new limbs, being assessed by the technician for necessary adjustments. In another room Louisa is talking to a young boy and his mother. He was a baby when a bomb killed two of his siblings and blew off his legs. Over six thousand limbs have been fitted at these clinics since 2013. Hands up funded a new digital machine which saves time to make prostheses, and training. There are 18 trained technicians who used to be barbers, teachers, students, before the war. Malik, a surgeon who left Syria in 2013, the day after his release from ISIS detention, looks tired. 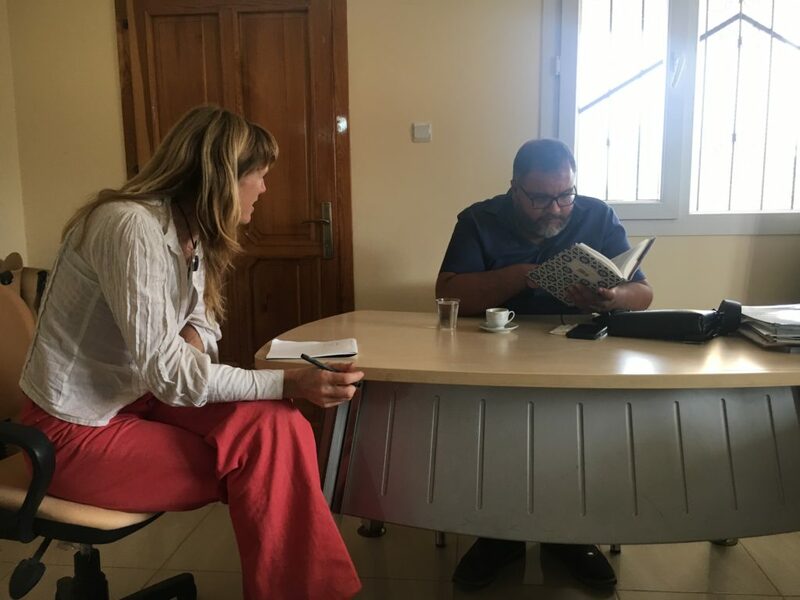 He manages many aid projects in Syria, including the medical centres whose exteriors are carefully left dusty and unkempt, so they are less likely to be targeted and destroyed. We talk briefly about food, which he loves. He misses the countryside around his home town, Deir Ez-Zor, terribly. He’d grill green wheat to make freekeh or go fishing fish with a friend who’d been killed in the shelling. ‘I’ll never go back there’, he said simply. Later we all shared a lunch of grilled tender chicken, lamachun flatbreads spread with seasoned minced lamb, bright fresh flat leaf parsley on the stalk with Ayran salted, yoghurt and coke to drink. The following two days we spent in Gaziantep, the sixth largest city in Turkey, where many NGOs are based, as well about 300,000 Syrian refugees. The Syrian and Turkish projects we heard about ranged from health centres, schools, training courses and an online registration system for the babies of Syrian women and ISIS fighters. Without the name of a father, these babies are not recognised by the state. We heard that many donors don’t want to back Turkish-based projects because of Turkey’s role in the civil war. Every morning before breakfast, when the light was beautiful and the streets still quiet, I’d make for a small wholesale fruit and veg market among the grocers shops near the old fort. Truckloads of mint, grapes, garlic, pale cucumbers, olives and small red peppers were unloaded. I bought or sampled dried brown apricots, heavenly-smelling chilli flakes, gleaming, garnet-coloured sumac, mulberry sherbert, slender pistachios, strings of dried aubergines, kaymak (clotted cream), and sour sumac molasses. Open dishes of honeycomb and plastic sacks of cheeses in brine abound. Cheese is popular here. It comes feta-like, with or without nigella seeds; or more mozzarella-like, in cubes, plaits and strings. Pickling is also big: whole heads of garlic, cucumbers, vine leaves and sour green plums. You can buy your olives, crack the flesh in a street-side mangle so they’re ready to be brined, and wheel them home. 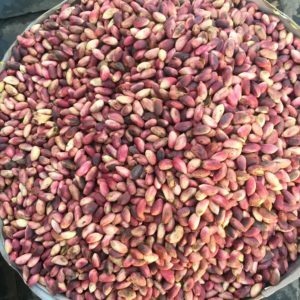 Nearby in the copper bazaar, metal workers beat or forge pots and skewers alongside spice merchants who grind the blue-green seeds of the turpentine tree (from the pistachio family) to make special menengic coffee paste. These were 3 special baklava-punctuated days. I’m inspired. Ruth Quinlan has been cooking for Syrian Supper Clubs in London and Bristol since 2014. She paid her way on this trip. Ruth is a chef and writer and has fed everyone from prime ministers to pop stars. She started at the Eagle, compiling their book Big Flavours and Rough Edges, and was head chef at the Bermondsey Kitchen and E5 Bakehouse. She has also toured the world as a travelling chef and once toyed with becoming a tattooist in Ibiza - for our sake and yours, we're delighted she chose the wooden spoon and not the needle - the food she produces has a beautiful balance of flavour, colour and beauty. She has been cooking for Syrian Suppers since 2014.